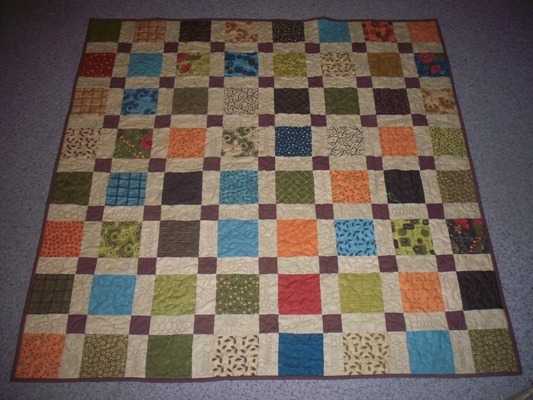 Long ago I made a quilt that was a Disappearing Nine Patch. People told me again and again that no, I was wrong and that it wasn’t a Disappearing Nine Patch. I have done a couple blog posts about this before but I still get questions…I am hoping this will answer the questions. Here’s the quilt. It’s self sashing. 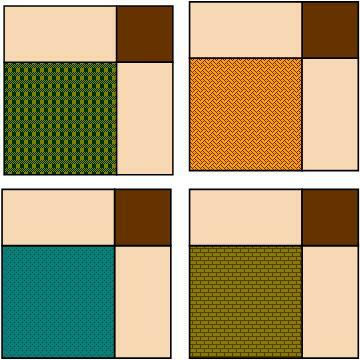 To make this version that is 49 1/2″ x 49 1/2″ you will need…. 1/2 yd for binding cut into 5 ~ 2 1/2″ strips. 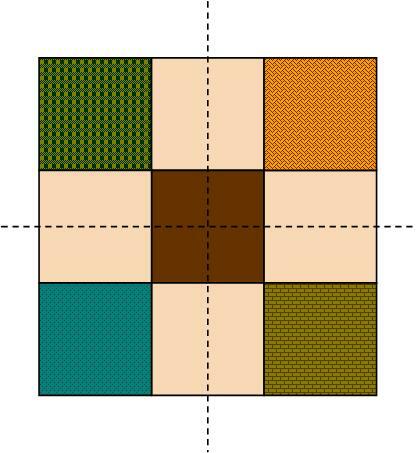 Sew the blocks into nine patches as shown. Cut those nine patches as shown. There you have it….It really is a Disappearing Nine Patch! After the rows were assembled, we went back and removed the right brown and cream sashing row by ripping it off with the seam ripper. Then we added cream borders to the outside. Here are other quilts we made using the same technique: Tranquility Quilt and Iowa Hawkeyes Version. 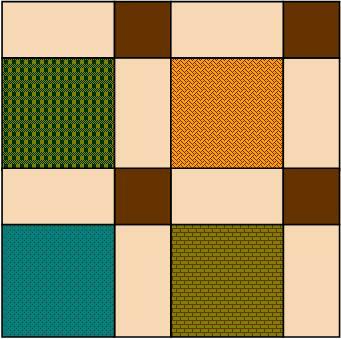 This entry was posted in Quilting, Tutorials on October 18, 2012 by Jo. I love this technique. I have seen each of your blog posts about it. I can totally see how it is a disappearing 9 patch. I think it would be great to use for an I spy quilt. Thinks for showing us how it works again. Have a great weekend. Love this pattern. I have made it several times. Super fast and fun. Takes me longer to pick out the fabric. Thanks for all you share. Have fun with your longarm. I made your version of a D9P when you first posted a photo of yours and it’s about to be put on one of our full-size beds! Thanks again! Oh! I want to try this. Maybe Christmas break? I’m a teacher so my sewing time is limited. thanks so much for this tutorial. Oh and thanks for the link to Country Threads- I was not familiar with their site. Thank you for a great tute. Your quilt is wonderful. I have made both versions and love them both. I love this version. I hate doing cornerstones but I like the look so a d9p like this would be perfect for someone like me. I did one of these when you mentioned the quilt last time. I want to add a bit more but love the pattern. Thanks for the tutorial. Just visited Country Threads and will definitely be a regular. I love how it self sashes! How did you press the original 9 patches? Do the seams nest? I think that I must have pressed incorrectly, because mine didn’t. Thanks,Jo. It absolutely is a D9P! A very nice pattern for the days when you just want to sew! Sweet! I love Disappearing Nine Patches! I’ve made a few, and I love the look and the simplicity. I also love the intrigue of sewing something together, cutting it up, and then sewing it together again for a totally new look! Pingback: A Friday Finish and a Deal for You! Thank you so very much for this tutorial! I belong to some 5″ swap groups and I needed ideas, this is perfect! Thanks go for the tut on the 9 p quilt. And I want to say I am so sorry about Gracie. I missed what happen to her. Just want you to know she will always live in my heart. I am going to try your recipe of the crock pot chicken Sunday. I just love your bloggs but sometimes I missed some. I can understand why someone looking at just the quilt wouldn’t think it was a Disappearing 9-Patch. Love how you put it together and it looks wonderful with no borders. Thanks for sharing. I would have never thought this was a D9P quilt. I like that layout. I don’t really like to make sashings and cornerstones and this eliminates that. Thanks so much for sharing. Jo, Thanks for the pattern. Your quilt is so cute and I love how you quilted it with bugs. I enjoy your blog. I like the simplicity of the way it looks with how you turned the pieces after cutting. The other way I have seen the pattern is to turn two of the pieces differently than the others, so that you end up with a block that kinda tessellates across the quilt. I can not accurately describe how to turn them & I had to leave one sample block sewn in with the cut fabric so I will remember how to do it after the one time I was shown how it worked. I love it and THANK YOU for sharing. It’s all in how you place the lights and darks in the 9 and how you twist them afterward. I am totally going to make one in the near future. This technique is so much fun. I love to see the change when you rearrange the blocks. I made two prayer shawls using this method. It goes very quickly. Thanks! Yes, this is a disappearing nine patch. TO ME, it is cut like a DNP, just sewed differently. Brilliant, I’m going to go make one now! Just sitting here a-grinnin’. Only found this just now and love it!!!! Kudos for thinking outside the box and changing a traditional pattern to something new. I will have to share this with my other quilting friends. They’ll love it. Please explain why you need to rip off the side sashes or pieces. I am confused. Thanks. Do you press all 9-patches in the same direction, or do the patches for the next row need to be pressed in opposite directions? Fantástic. Thank you for sharing. 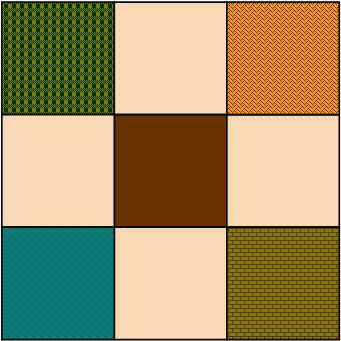 This pattern Will be my Next proyect. Make the quilt and you will see that one side has sashing, the other doesn’t. You’ll either have to add sashing from one side or add it to the other to balance the quilt. Oh my gosh this is the BOMBDIGGITY !! Thank you very much for this post ♥️YES you are definitely correct on naming it ! I have been sewing and quilting most my life in Amish community , this is a WIN WIN . This is an awesome quilt design! I’m having trouble viewing it because of the adverts running full-screen behind it. Is there a way of finding it without the adverts?